﻿ Beautiful Qincheng Township in Hami in Xinjiang in August. In the beginning of August, in Qincheng town at the bottom of eastern Tianshan Mountains in Hami (Kumul) City, Xinjiang people plant crops due to the benefits of the geographical location. The view here includes: yellow sunflowers, purple potato flowers, green corn, red Flos Carthami, among others. Standing on the brown hillocks and looking around, greeted by the palette of nature, its beauty makes viewers speechless. 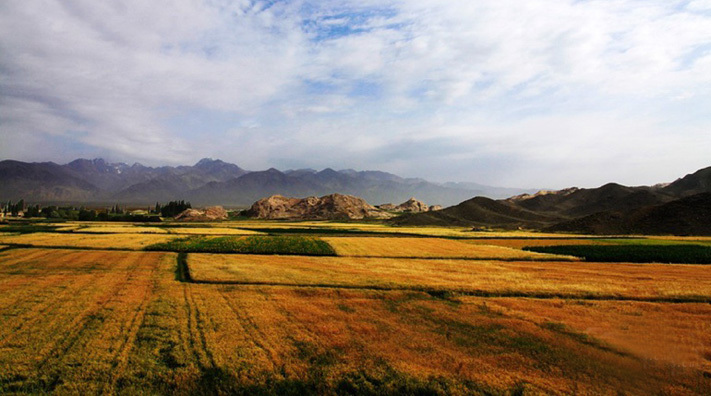 Qincheng Township is located at the frontier of the eastern part of the southern region of Tianshan Mountains. It is located 104 kilometers from Hami city, across Tianshan Mountains facing Yiwu, Gansu Province on the East, and the Northeast bordering Mongolia. With a border of 26.17 kilometers, Qincheng town is one of the border towns in Hami. With a total area of 19,900 square kilometers, Qincheng town is inhabited by three nationalities that include, Uygur, Han and Kazak. The total number of households in this area is 3,154, and the population is 10,060. With a long history, Qincheng town was referred to as "Rouyuan Town" and "Rouyuan County" in Sui and Tang Dynasties. It was an important post on the Silk Road with ancient cultural remains today. There are ancient rock paintings in Baishan Mountain and Ergong village dating back to 1,000 years ago reflecting local life. The paintings have a high aesthetic and historical value. How do you get to Qincheng town? There are only buses between Hami and Qincheng town. How many hours does it take? - The duration is about 2 hours.